We should have 7 in stock. Need more? It usually takes us 1 - 2 weeks to bring more in. 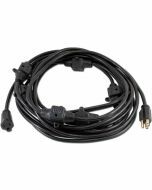 Whether you need to power an orchestra pit or a string of incandescent PARs this extension cord fits the bill. Measures 23'-4" long with 6 outlets evenly spaced across it's length. 11" x 11" x 2.7"